Botsify provides you comprehensive analytics with Dashbot.io. For those who don’t know dashbot.io, it is a premium tool for chatbot analytics. It helps you understand your user’s behavior, lets you observe trends, and each conversation individually. It’s like Google Analytics for Chatbots. Dashbot.io has several plans that allow you to explore and utilise really exciting features. For instance, "Human Takeover" that lets you monitor each and every conversation happening live between your chatbot and the user. At Botsify we believe that Analytical tools and the core chatbot development tools should be separated. Just like your website and Google Analytics is! So we as a startup can focus on useful things, like making algorithms better and making UI similar for you. The first step to be able to track something is to have something you want to keep track of. So you will create a chatbot with Botsify, please check out our several tutorials that we have for creating chatbots easily. Once you have created a chatbot with Botsify, you will go into “Promotion” in the left side menu of your Botsify account. In the Promotion dropdown click on “Analytics” and here you will see an option to integrate it with your dashbot.io account. Once you click the Dashbot integration, you will see an input field, asking you about your Dashbot API Key. To get this key, signup/login to Dashbot.io and create a chatbot. By following the instructions, you can see your API key right away. 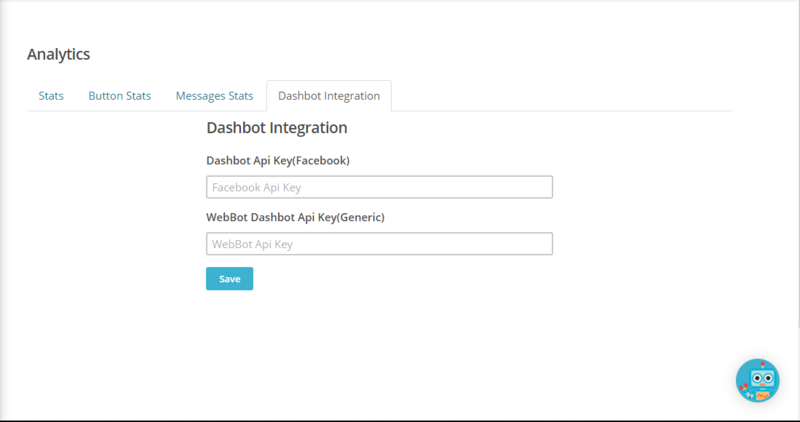 Copy this key and paste it back in the Dashbot API Key for Facebook or WebBot as per your requirement. Click save, and that’s it. You have integrated your dashbot account with Botsify and all your analytics and messages should be tracked in Dashbot from now on.